The name of Horch was a synonym for noblesse, highest quality and noble lines in car manufacture in that time. 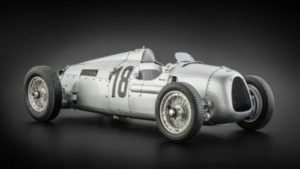 The 853 might have been the most remarkable model the car manufacturer of Zwickau presented the public in 1937. 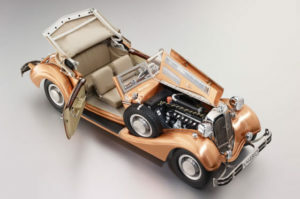 The four-seater sport convertible with its 5-litre-engine was the preferred vehicle of industrialists, actors and high politicians – shortly speaking: the High Society. Still today, this Horch car seems as fascinating as in that time. 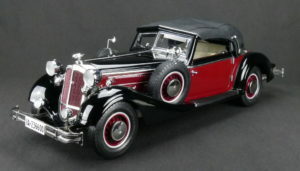 In order to show its flair to its best advantage, we have chosen the large scale of 1:12 for its reproduction and can offer you now a model of extraordinary charisma, elegance and constant value which stands out due to the love of detail. There are four attractive paintworks. Select your favourite model!